A mysterious man that appears in Aoba's room unannounced. His body is covered in piercings, twenty-six to be exact. He continues to show his technological prowess by hacking into the security system in Platinum Jail and instigating a drive-by Rhyme game with Aoba. He leads his own Rhyme team, Ruff Rabbit, and carries a group of All-Mates hanging on his hips called Usagimodoki, cubes with bunny patterns (real world) that take the form of real bunnies with red boxing gloves in Rhyme. 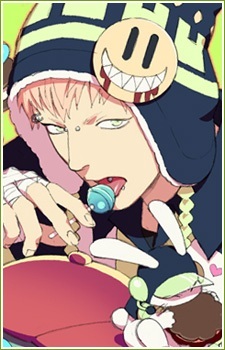 Apart from his tongue, Noiz has no sense of pain and a numbed down sense of touch. This has caused him to enter numerous fights because of his inability to understand physical pain and for that reason he was abused by his parents and locked in a room for many years, forced to suffer loneliness and isolation. Due to this, Noiz believes that people will not help him unless there is something they can gain in return. He has a seventeen year old brother named Theo, who looks very similar to Noiz in appearance. Theo is perhaps the only one Noiz cares for as much as he does, save for Aoba. His real name is Wilhelm.